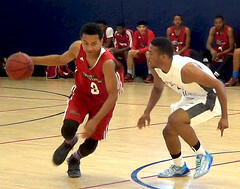 True Ballerz 17U won the Pangos Sweet 16 Diamond Championship on April 21-23 in Las Vegas. 17U went 4-0 and beat Team Vegas in the title game. 17U is now 14-3 on the season and will play three tournaments in Phoenix in May. True Ballerz 17U traveled to Las Vegas for the BigFoot Hoops Easter Showdown ahead of Live Period events. 17U went 2-2 against a very strong field, including EYBL teams. They crushed Utah Supreme 100-33 and easily got by PV Elite (Utah). 17U’s run was ended by eventual tournament champion 702 Attack. 17U is now 10-3 on the season and is headed to the ultra competitive Pangos Sweet 16 this weekend. True Ballerz 17U won the TresHoops Sweet 16 Tournament Gold Division on April 2, 2017. The field of 9 teams included WCE, AZ Hype, Team Phoenix, Golden Gators and Team Artis. True Ballerz won Pool C then beat Team Phoenix 60-47 in the semi-finals before beating Nogales Thunder 56-41 in the championship game. True Ballerz 17U is now 8-1 on the season. Next up are the BigfootHoops Easter Showdown and Pangos Sweet Sixteen tournaments in Las Vegas. 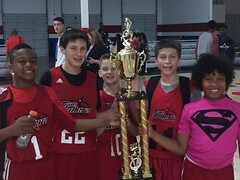 True Ballerz 14U, using aggressive defense and smart shot selection on offense, brought home the second place trophy at the Inspire D2 Tournament April 2, 2017. 14U went 2-0 in pool play and beat Inspire Tru Heat in the tournament semifinals. Tournament MVP Q’bon Sullivan was a force inside, rebounding out of his zone and getting many and-one opportunities. Alex Fugate showed great court leadership at point, Tanner Pate and Trent Murray stretched the defense with outstanding outside shooting and Daniel Shores got blocks in bunches. This was a true TEAM performance as every player contributed. 17U opened the season with a strong showing at the Southwest Showcase Main Event. True Ballerz made the semi-finals out of a very competitive field of 24 teams. Using strong defense and balanced scoring on offense, True Ballerz beat Arizona Empire 66-44, Mesa Jackrabbits 40-26, AZ Power North Blue 62-50 and Arizona Rebels 64-48 before losing a close one to AZ Power Tucson 2017, 60-56. True Ballerz 17U is 4-1 heading into next weekend’s Tres Hoops Sweet Sixteen Tournament in Phoenix.